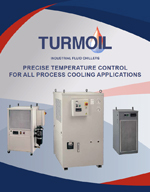 Turmoil is a US manufacturer of industrial liquid chillers. We are experienced in solving the challenges of achieving precise temperature control while minimizing downtime in a harsh industrial environment. For many years, Turmoil coolers have set the standard for quality and reliability.